Talk about rangefinder cameras, lenses and accessories. The pressure plate in this camera has a horizontal play (in the direction of film movement) of a few mm. The plate is firmly held by its springs and seems to cover the film gate in every position of its short trajectory. It does not feel as if something is loose. There is no vertical movement, just horizontal translation. ¿Any other Konica III owner out there? I would like to confirm if this is a camera feature or something I should have repaired. The camera has given good service, but in a few frames I have noticed lack of sharpness on a side, which may or may not be caused by the pressure plate. Maybe it was put back in backwards, so that the long slots of the springs are on the wrong side, allowing the travel to occur. Thanks PF for the suggestion. Far as I can see, the springs seem attached to the pressure plate by rivets that pass through the plate and through slots in the springs. I dare not mess with this because I do not have the right tools or experience. Will check with ny tech later on. In any case, I have now figured out that the plate should be in the position opposite to the hinge, in order to be centered on the film gate. I have also verified that the plate does not slide because of film friction when winding film, so I can live with this. Just need to remember to push the plate to its correct position before closing the back, next time. I would get my Konica III and check but I have no idea of which box it might be in. I know, that wasn't much help at all. Well, surprisingly, I found the camera. Here's a photo of the pressure plate. My pressure plate is held by traditional springs and posts. Thanks a lot Mike! Your example gave me enough courage to press those springs harder. I had never taken out a pressure plate before. The plate is held exactly like in your camera. However in my example all four corners of the plate are cut out. The plate is completely symmetrical as far as I can measure. The slots in the springs look a bit longer than yours. With those long slots there has to be some sliding movement. I have to move the plate all the way opposite to the hinge side if I want it to cover the film gate symmetrically. This I will try next time. Maybe opening the camera in the dark in mid-roll and trying the other extreme position, for the sake of experiment and to confirm or discard the issue. Just out of curiosity, my serial number is 1587xx. 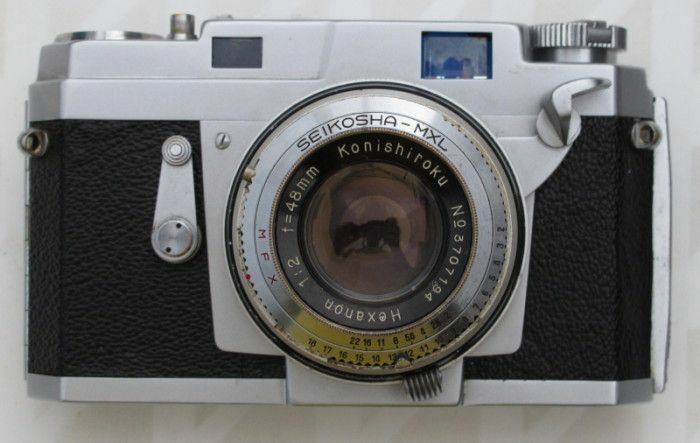 Is your Konica III earlier or later than this one? I'll let you know about the serial number tonight. That's rather odd about the pressure plate. I wonder what would be the advantage or disadvantage to having two or four corner notched. I've owned three of these, and each was slightly different from the other. It wasn't anything major - just little things. Like the viewfinder display differed slightly, or the focusing tab on the lens was a different design. And now the pressure plate. Your camera uses the EV system, while mine doesn't. And your camera has an inscription on the lens face ring, while mine is under. I suspect that I have an earlier camera. Here's my Konica III. Serial number 103705. This was the third camera that I bought when I got back into photography in 2000. I think it was a Voigtlander Vito B, Retina IIIc and then this one. Indeed yours is an earlier example. Interesting variations for collectors. Maybe the plate difference is a process improvement. The symmetric pressure plate could be simpler to mount than the earlier design - no correct orientation needed, that is half a movement less on average. 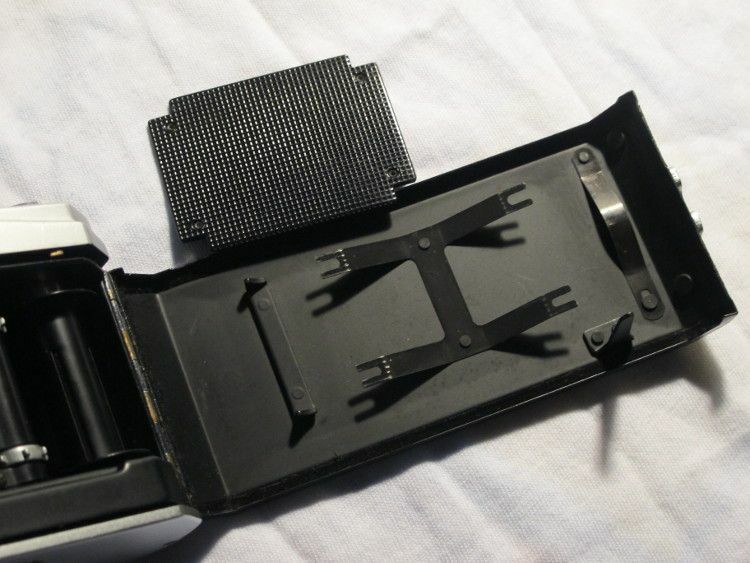 The longer slots would also help to absorb small tolerances in spring dimensions or height. The Japanese were getting really good at that game of simplifying operations and reducing chances of error. In any case this is a camera to enjoy, especially the lens.